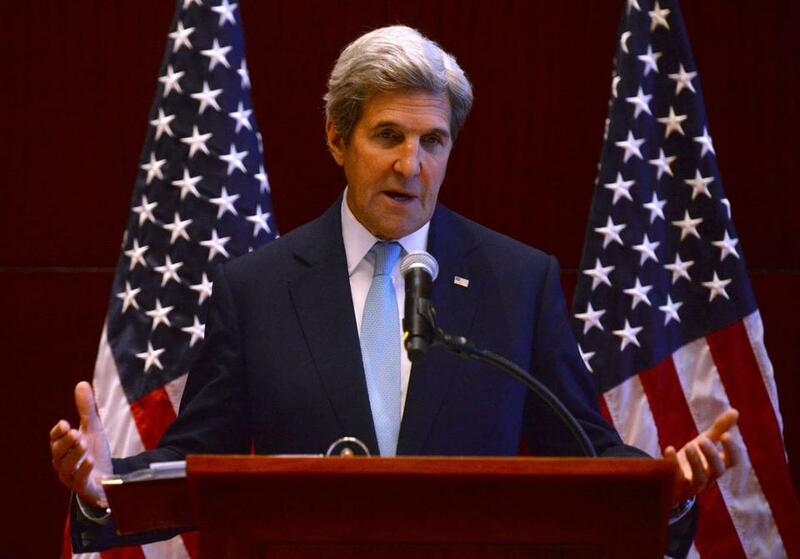 Secretary of State John Kerry spoke during a news conference Tuesday in Vientiane, Laos. VIENTIANE, Laos — North Korea’s pursuit of nuclear weapons — when the world is trying to rid itself of them — is ‘‘very provocative and deeply concerning,’’ US Secretary of State John Kerry said Tuesday, warning that there will be consequences if it does not stop. Kerry, who was in the Laotian capital to attend an Asia-Pacific security conference that includes North Korea, said its actions present a very serious threat not just to this region, but also to international peace and security. He said North Korea should learn from Iran, also a bitter enemy but with whom the United States and other countries made a deal to end its nuclear program. ‘‘Iran, a powerful and well developed country with a long history of thousands of years,’’ has decided it would not pursue nuclear weapons in order to have economic sanctions lifted, Kerry said. ‘‘So countries can do this. But North Korea alone ... the only country in the world defying the international movement towards responsibility, continues to develop its own weapon, continues to develop its missiles, continues the provocative actions,’’ he said. North Korea says it needs nuclear weapons to cope with what it sees as US military threats. The United States stations about 28,500 troops in South Korea and regularly holds joint military drills with South Korea. Pyongyang has long demanded Washington withdraw its troops from South Korea and stop the joint drills, which it calls an invasion rehearsal. Kerry said one of the issues that came up in nearly every meeting he had in Vientiane is the ‘‘very provocative and deeply concerning behavior of the DPRK,’’ using the acronym for the country’s formal name, the Democratic People’s Republic of Korea. Some analysts say North Korea has developed a handful of crude nuclear devices and is working toward building a warhead small enough to mount on a long-range missile capable of reaching the continental US. However, South Korean defense officials say the North has neither such a miniaturized warhead nor a functioning intercontinental ballistic missile. Kerry noted that the UN Security Council in March adopted the ‘‘toughest set of sanctions in a generation’’ on North Korea. ‘‘But despite this and numerous other Security Council resolutions, the DPRK chooses to flout its international obligations,’’ he said. He urged the international community to fully enforce the sanctions imposed on North Korea. Asked if that exception referred to North Korea, Kerry said unless Pyongyang has suddenly changed its position — and he is presuming it has not — he was indeed referring to North Korea.